You started studying Law in Athens but the world of jewelry eventually stole your heart. What was the reason for the change in course of your career? Even though, in retrospective, Law school was an invaluable experience, it was never a passion of mine. While studying Law and in the midst of exams lost in volumes of law books I felt an urge to express a more creative part of my self. At first it was a matter of using my hands and whatever materials I could find at my disposal to create tangible objects. The relationship between a creative and the material, the process of manipulating it with your own hands, was my first revelation. I believe that the frustration I felt, trapped in something so structured and confined as Law, gave me a much needed push to explore my very well hidden at the time, creative oneself. Your jewelry is impressive; dynamic, unconventional and imposing in character! To which woman’s character do you think your jewels match more to? For me jewelry is not an afterthought, it is not an accessory to compliment a certain outfit. It is the piece you wear and somehow feel stronger, radiant, as if the ring on your finger or the cuff on your wrist encompasses your fierceness. Symbiosis collection has a personality of its own so I would say it is about a bold sophisticated woman that wants to stand out. Why do you use marble instead of others as your primary raw material? Are you going to keep it’s usage for your future collections? Should we expect something new in your designs? Jewelry for me is a form of art. You have to find the right medium to express your vision in it’s full potential. Symbiosis is a first peek into my black and white cosmos, shaped by an array of contrasting experiences and diverse visual stimuli. Aiming to give a tangible form to duality and differentiation I set my mind towards the fusion of contemporary and classical materials. The idea of using marble became an obsession serving multiple roles in my creative process; a beautiful natural stone that challenged myself as a designer but also the concept of where luxury lies within a piece of fine jewelry, a material that adds to the preciousness of the making process. White Thasos marble pure and illuminating became the perfect companion of black gold, each highlighting the other in a symbiotic relationship of modern adornments. I plan on using marble for my future collection and I am sourcing different types and colors of the stone in order to explore the material at its fullest. What’s your opinion about Greek jewelry designers? 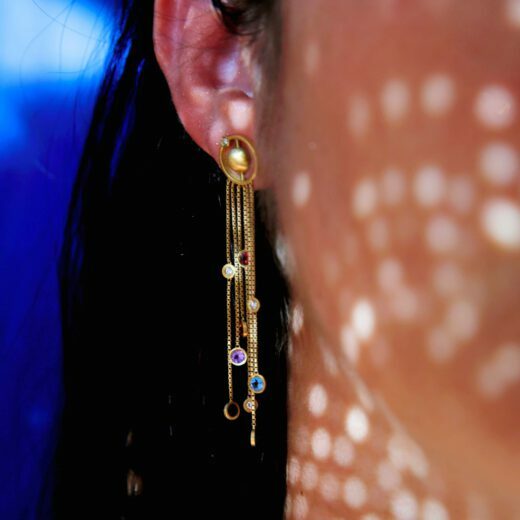 Do you think that Greek jewelry designs can stand out on the international scene? 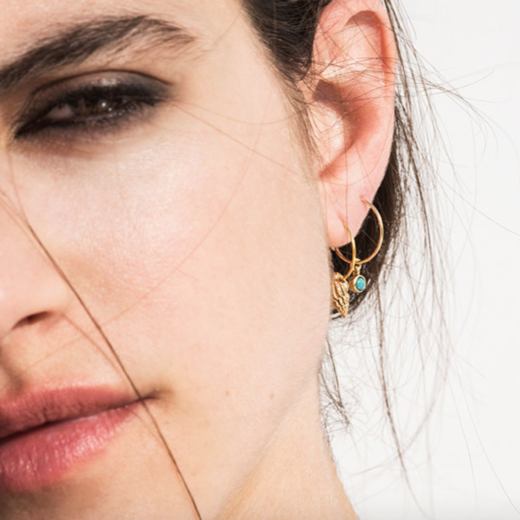 Do you have a Greek jewelry designer that you admire more? I have always been a fan of Greek jewelry. Greeks have a long history in the art of jewelry and in the last few years Greek designers, in my opinion, have taken over the fine jewelry world. It is a matter of elegance and beauty, which is always evident in the work of Greek Jewelry designers, as well as the importance of craftsmanship, that Greek designers pay attention to. 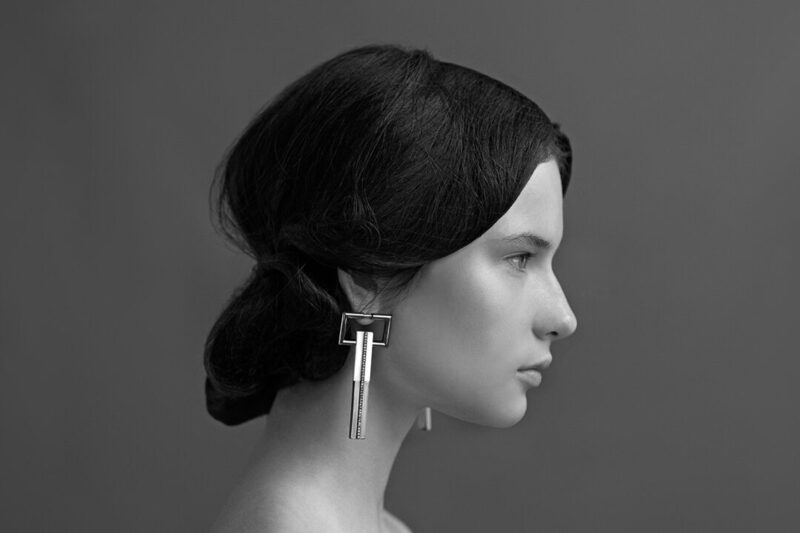 There are many jewelry designers I admire, each one for different reasons. Elena Votsi was my first idol, I am in awe of her sculptural pieces, Melanie Georgacopoulos for her impressive and innovative use of pearls and Yannis Sergakis for his exquisite design aesthetic. What are your future plans? Where do you see the brand, ‘Ioanna Souflia’ in two years time? At the time I am creating some additional pieces, which will be launching at Couture in Las Vegas in June and I am designing a capsule collection for Paris Fashion Week in October where I will be presenting a more colorful side of Ioanna Souflia. I am confident that many exciting projects will come in the future, I already have an intriguing proposal, and I would like to see the brand grow without losing its character.